blackgivesback: Photos of the Day: Mack's Miracles All Star Charity Weekend & National Lab Day in D.C. Photos of the Day: Mack's Miracles All Star Charity Weekend & National Lab Day in D.C.
Marcus McNeill of the San Diego Chargers (center) and guests at the 2010 Mack's Miracles All-Star Charity Weekend in Atlanta, April 23, 2010. 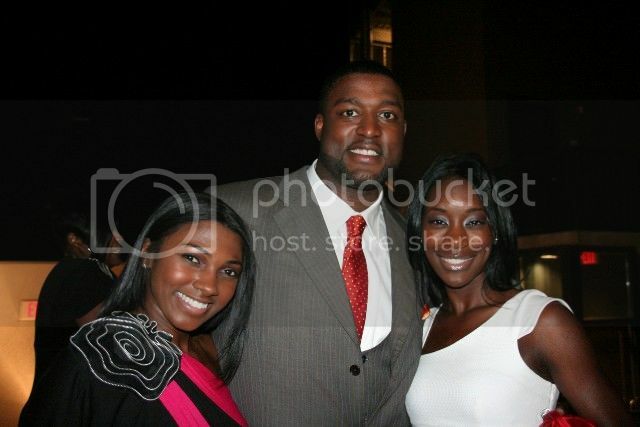 From Garner Circle PR: "Two-time Pro Bowl offensive lineman Marcus McNeill, #73 of the San Diego Chargers, along with his foundation Mack's Miracles was the highlight of Atlanta's social and philanthropic calendar on Friday, April 23rd with the 2010 Mack's Miracles All-Star Weekend kick-off event: Sky Grey Luxury Lounge. Presented by Grey Goose premium vodka, the evening was both a night of entertainment as well as a night of indulgence with a mission of purpose. Overlooking the ever enticing Atlanta skyline, the stylishly-elite mixed and mingled under the stars at a private rooftop location. While glasses brimmed, taste buds were tantalized with culinary delights from Justin's Restaurant, owned by hip-hop mogul Sean "Diddy" Combs. Guests received complimentary massages and choice bid on sporting memorabilia during a silent auction in benefit of the foundation. Mack's Miracles founder, Marcus McNeill, delivered a speech on the foundation's vision of improving the lives of children through education and encouraging healthy lifestyles. In a memorable heartfelt exchange, Shad Ireland of Renal Resources, culminated the night by presenting McNeill with a check in the amount of $7,500 for the Mack's Miracles Foundation. Notable guests of the Sky Grey Luxury Lounge included TV Chef Marvin Woods, Brandon Siler (# 59 of the San Diego Chargers), Barbadian actress Mari Morrow, and Rashidah Ali (owner of the newly debuted B Chic Shoetique in Atlanta/Bourgeoisie Shoetique (NYC) and the new Vh1 show, Basketball Wives)." For more information, visit: www.macksmiracles.org. 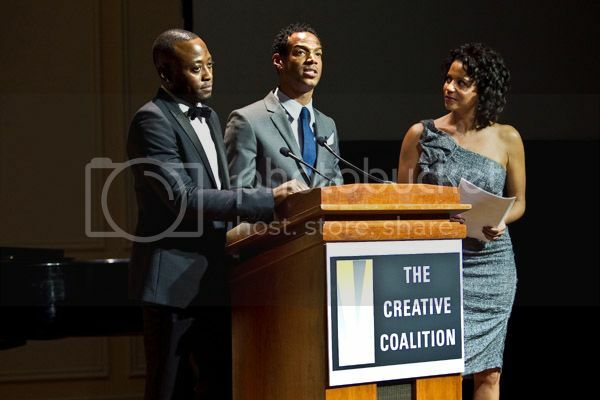 Omar Epps, Marlon Wayans and Gloria Reubens make remarks at the Creative Coalition's Salute to Arts and Entertainment with Martini & Rossi at The Library of Congress, April 29, 2010 in Washington, DC. On April 30, 2010, the Creative Coalition and members of the entertainment community partnered with National Lab Day, an initiative promoting S.T.E.M. efforts in schools. Among the entertainers who participated were actors Omar Epps, Marlon Wayans and Gloria Reubens. Together, they are bringing attention to Congress on the role that the arts play in the arenas of science, technology, engineering and math (STEM) programs in schools, and to promote learning through discovery and exploration. National Lab Day is on Wednesday, May 12th – but the concept is more than just one day. It is a year-round, nationwide effort to bring hands-on learning to students working on STEM projects by collaborating with experts (scientists, engineers, architects, etc.) who currently work in those fields. National Lab Day is working with more than 1,000 schools in all 50 states and building to 10,000 active projects around the country by the end of the year.